Dr. Prescott serves as Interim Chair of the Department of Pharmacy Practice. He practices/teaches in acute care general pediatrics. 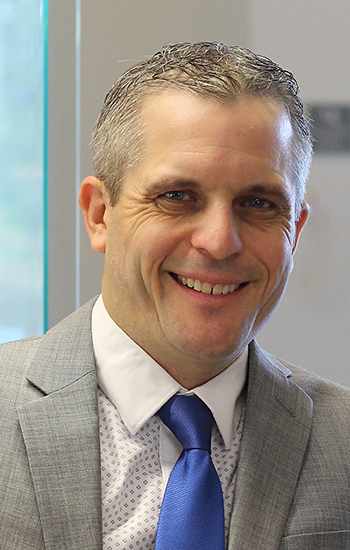 His teaching activities focus on pediatrics and patient assessment, wherein he has integrated blended-learning using a flipped-classroom model, case-based learning, team-based learning, and simulation-based learning. His educational scholarship focuses on curriculum and active learning, and his clinical scholarship focuses on pediatric infectious diseases and pulmonary disease. Clinical Research: Pediatric infectious diseases and pulmonary disease, with a focus on immunizations and cystic fibrosis. Scholarship of Teaching and Learning: Descriptive and survey-based research focusing on curriculum and active learning. Fusco NM, Francisconi R, Meaney CJ, Duman D, Frederick CA, Prescott WA. Association of Vancomycin Trough Concentration With Response to Treatment for Acute Pulmonary Exacerbation of Cystic Fibrosis. J Pediatric Infect Dis Soc. 2017; 6(3). Prescott G, Vu B, Alsharif N, Prescott WA Jr.. Education in global health in US pharmacy colleges and schools. Am J Pharm Educ. 2017; 81(2). Prescott WA, Woodruff A, Prescott GM, Albanese N, Bernhardi C, Doloresco F. Design and Assessment of a Blended-learning Model Integrating Team- and Case-based Learning to Teach Patient Assessment Skills in a PharmD Program. Am J Pharm Educ. 2016; 80(10). Prescott WA Jr.*, Ives A, Huntress J, Johnson MS. Engaging Postgraduate Year-2 Pharmacy Residents in Formal Co-evaluation of Platform Presentations at a Regional Residency Conference. Am J Pharm Educ. 2016; 80(8). Fusco NM, Toussaint KA, Prescott WA. Antibiotic management of methicillin-resistant Staphylococcus aureus--associated acute pulmonary exacerbations in cystic fibrosis. Ann Pharmacother. 2015; 49(4). Fusco NM, Prescott GM, Prescott WA. Motivations for pharmacy students to join professional organizations. Currents in Pharmacy Teaching and Learning. 2015; 7(1). Prescott WA. A Survey of Extended-Interval Aminoglycoside Dosing Practices in United States Adult Cystic Fibrosis Programs Respir Care. 2014. Prescott WA, Dahl EM, Hutchinson DJ. Education in pediatrics in US colleges and schools of pharmacy Am J Pharm Educ. 2014; 78(3). Prescott WA Jr., Mancuso M. Clinical impact of laboratory error on therapeutic drug monitoring of extended-interval tobramycin therapy in cystic fibrosis. Sage Open Medical Case Reports. 2014; 2. Hutchinson D, Barclay M, Prescott WA, Brown J. Inhaled aztreonam lysine: an evidence-based review Expert Opin Pharmacother. 2013; 14(15). Prescott WA; Johnson H; Wrobel MJ; Prescott GM. Impact of Electronic Device Use by Pharmacy Students on Academic Performance. Impact of student use of electronic devices during class on academic performance.. 2012; 76. Prescott WA. National Survey of Extended-Interval Aminoglycoside Dosing in Pediatric Cystic Fibrosis Pulmonary Exacerbations. J Pediatr Pharmacol Ther. 2011; 16. Prescott WA; Hutchinson DJ. Respiratory syncytial virus prophylaxis in special populations: Is it something worth considering in cystic fibrosis and immunosuppression?. J Pediatr Pharmacol Ther. 2011; 16. Prescott WA; Pitman AE; Nagel JL; Pettit RS. Continuous Infusion Anti-pseudomonal Beta-Lactams in Patients with Cystic Fibrosis. Pharmacy & Therapeutics. 2011; 36. Prescott WA; Doloresco F; Brown J; Paladino JA. Cost Effectiveness of Respiratory Syncytial Virus Prophylaxis: A Critical and Systematic Review. PharmacoEconomics. 2010; 28. Prescott WA. Preparing Pharmacy Students for the ASHP Midyear Clinical Meeting and Post-graduate Training Search. American Journal of Pharmaceutical Education. 2010; 74. Prescott WA; Nagel JL. Extended-Interval Once-Daily Dosing of Aminoglycosides in Adult and Pediatric Patients with Cystic Fibrosis. Pharmacotherapy. 2010; 30. Monte SV; Prescott WA; Johnson KK; Lori K; Paladino JA. Safety of Ceftriaxone at the Extremes of Age Expert Opinion on Drug Safety. 2008; 7. Prescott WA; Kusmierski KA. Clinical importance of carbapenem hypersensitivity in patients with self-reported and documented penicillin allergy Pharmacotherapy. 2007; 27. Prescott WA; Johnson CE. Antiinflammatory therapies for cystic fibrosis: past, present, and future Pharmacotherapy. 2005; 25. Prescott WA; Streetman DA; Streetman DS. The potential role of HMG-CoA reductase inhibitors in pediatric nephrotic syndrome Annals of Pharmacotherapy. 2004; 38. Prescott WA; Btaiche IF. Sincalide in patients with parenteral nutrition-associated gallbladder disease Annals of Pharmacotherapy. 2004; 38. Prescott WA; DePestel DD; Ellis JJ; Regal RE. Incidence of carbapenem-associated allergic-type reactions among patients with versus patients without a reported penicillin allergy Clinical Infectious Diseases. 2004; 38. Prescott WA; Callahan BL; Park JM. Tacrolimus toxicity associated with concomitant metoclopramide therapy Pharmacotherapy. 2004; 24. Prescott WA; Regal RE. Pressure ulcers: What to think when giving zinc. Pharmacy & Therapeutics. 2003; 28. Prescott WA Jr., Doloresco F, Bednarczyk EM, Prescott GM, Slazak EM, Woodruff AE, Brody PM Jr., Norgard NB.. Design, Implementation, and Assessment of a Program to Equip PharmD Students for Postgraduate Training. Am J Pharm Ed. 2017; 81(5). Fusco NM, Francisconi R, Meaney CJ, Duman D, Frederick CA, Prescott WA Jr.. Association of vancomycin trough concentration with response to treatment for acute pulmonary exacerbation of cystic fibrosis. J Pediatr Pharmacol Ther. 2017; 22(2). Prescott WA, Prescott GM, Doloresco F, Albanese NP, Woodruff AE. Academic Performance among PharmD Students in a Patient Assessment Course Sequence Utilizing a Blended-learning Model. Am J Pharm Ed. 2016; 80(5). Prescott WA, Doloresco F, Woodruff AE, Albanese NP, Bernhardi, Christian, Prescott GM. Student Perceptions of a Blended-learning Model Designed to Teach Patient Assessment Skills in a PharmD Program. Am J Pharm Ed. 2016; 80(5). Prescott WA Jr., Doloresco F, Woodruff A, Albanese N, Bernhardi C, Prescott GM.. Student Perceptions of a Blended-learning Model Designed to Teach Patient Assessment Skills in a PharmD Program. Am J Pharm Ed. 2016; 80(5). Prescott WA Jr., Prescott GM, Doloresco F, Albanese N, Woodruff A. Academic Performance among PharmD Students in a Patient Assessment Course Sequence Utilizing a Blended-learning Model. Am J Pharm Ed. 2016; 80(5). Patzke C, Prescott GM, Prescott., Jr. WA., Brody, Jr., PM. Comparison of Medication Prescribing Patterns between American and Dominican Republic Prescribers on Medical Mission Trips.. Pharmacotherapy. 2015; 35(11). Albanese N, Woodruff A, Prescott WA Jr.. Pharmacotherapy Education in US Colleges and Schools of Pharmacy. Am J Pharm Ed. 2015; 79(5). Prescott GM, Vu B, Prescott WA. Global Health Education in US Pharmacy Schools. Am J Pharm Ed. 2015. Prescott WA Jr., Ives A, Huntress J, Johnson MS. Engaging Postgraduate-year-2 Pharmacy Residents in Formal Evaluation of Platform Presentations at a Regional Residency Conference. Am J Pharm Ed. 2015; 79(5). Prescott WA, Fusco NM. National Survey of Treatment Strategies for Acute Bronchiolitis. J Pediatr Pharmacol Ther. 2015; 20(3). Prescott WA Jr., Dahl EM, Hutchinson DJ. Pediatric Education across US Pharmacy Schools: What is being taught and how?. Am J Pharm Educ. 2014; 78(5). Prescott WA. Infectious Diseases Education across US Pharmacy Schools: What is being taught and how?. Am J Pharm Educ. 2014; 78(5). Prescott WA; Monte SV; Prescott GM. Design and assessment of a didactic course preparing pharmacy residents for scholarship. Am J Pharm Educ. 2012; 76. Prescott WA Jr., Johnson HL, Wrobel MJ, Sustakoski K, Prescott GM. Impact of student use of electronic devices during class on academic performance. Am J Pharm Educ. 2012; 76. Prescott WA; Brazeau GA. Developing Leaders in Pharmacy: Assessment of Learning Outcomes for an Elective Leadership Course. Am J Pharm Educ. 2010; 74. Prescott GM; Fusco NM; Prescott WA. Motivations for Pharmacy Students to Join Professional Organizations. Am J Pharm Educ. 2010; 74. Prescott WA. Preparing pharmacy students for the ASHP Midyear Clinical Meeting and their post-graduate training search. Am J Pharm Educ. 2008; 72.